The holidays are starting to sneak up on us. I know it may seem like we have months, but I swear I always get caught unprepared. The worst is when I have guests coming over and I’ve planned for the meal, but forgot about appetizers. It just got a whole lot easier though thanks to Smucker’s Fruit & Honey selections. Now you can create this Fruit & Honey Goat Cheese Spread in a matter of minutes and you only need two ingredients. It’s a winning recipe for sure! This is sponsored by Smucker’s but all opinions are my own. Growing up we always had some form of Smucker’s jam or jelly in our house. It’s exactly the same at our house now. My youngest loves grape jelly and my oldest can’t live without her strawberry jam. 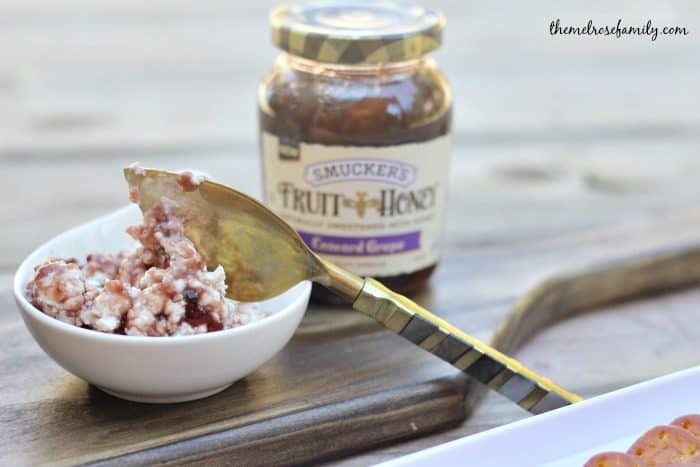 Over the summer I came across Smucker’s Fruit & Honey spreads and wondered what I might use it for. Appetizers is the first thing that came to mind. 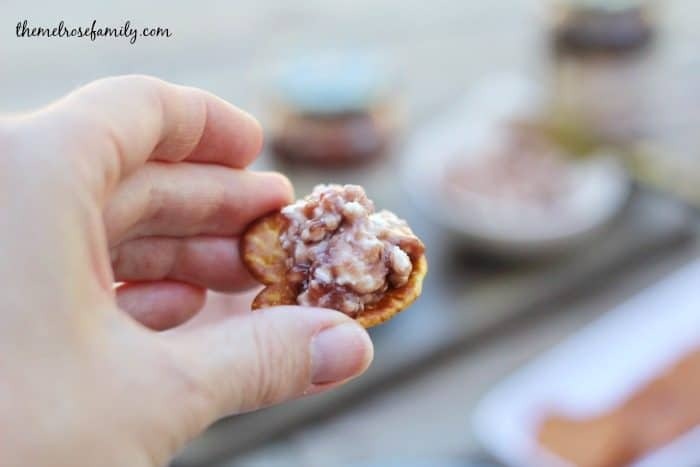 This is literally the easiest appetizer you will ever make and it combines the Fruit & Honey spreads with my favorite cheese, goat. 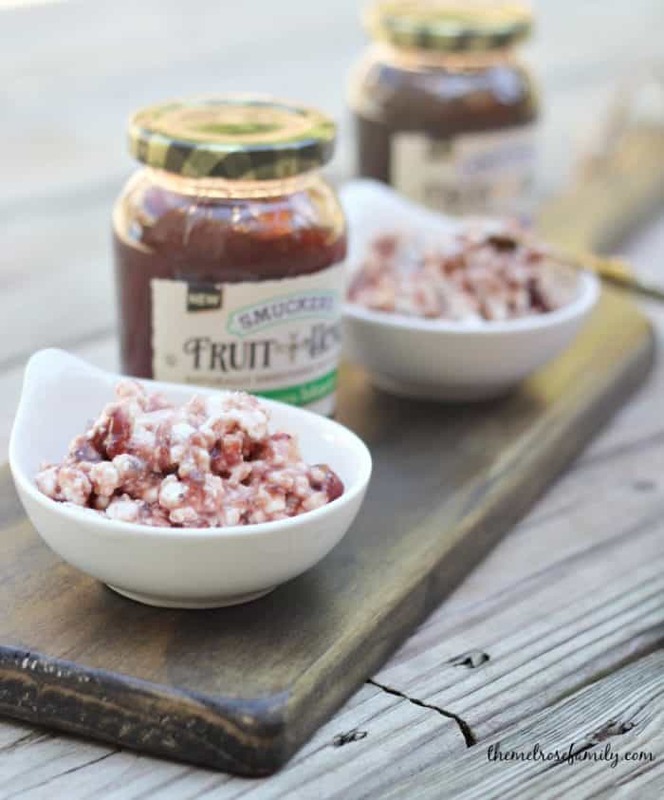 The combination of the goat cheese with the Fruit & Honey spreads is a winning combination. A little sweet and definitely rich. Just watch how easy these are. Plus, it’s an appetizer that everyone can help themselves to without feeling like they’ll fill up on the appetizer. The combination of the salty cracker with the rich goat cheese and sweet, while spicy spread is perfection. You also might have seen that Fruit & Honey Strawberry Jalapeño makes the easiest Strawberry Jalapeño Lil Smokies EVER. It doesn’t get much simpler than that. Whenever I can combine two ingredients and come up with something bursting with flavor, it’s a win in this house. Plus, the concord grape flavor gives an option for picky eaters that don’t want any spice in their life. You end up with bite size appetizers that everybody comes back for wondering the intricacy of the recipe. Meanwhile, it’s all the doing of Smucker’s Fruit & Honey spread. 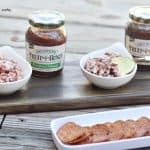 In need of a flavorful and easy appetizer to impress your guests? 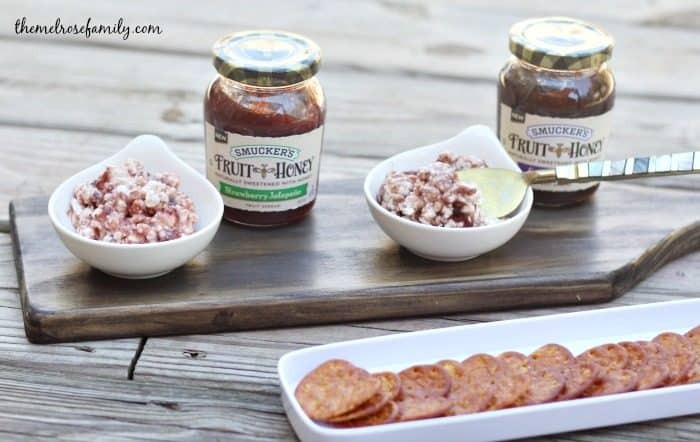 This Fruit & Honey Goat Cheese Spread comes together quickly and taste amazing! Separate half of the crumbled goat cheese into one bowl and the other half in a second bowl. Add a tablespoon of the Fruit & Honey Concord Grape to one bowl and a tablespoon of the Fruit & Honey Strawberry Jalapeño to the other bowl. Mix both bowls and pour into a two separate serving dishes. Place a dollop of the Fruit & Honey Goat Cheese Spread onto a cracker and enjoy!